It's Back to School time! Orkin is back with Household Pests 101 – featuring some of Orkin’s scientific knowledge of pests. 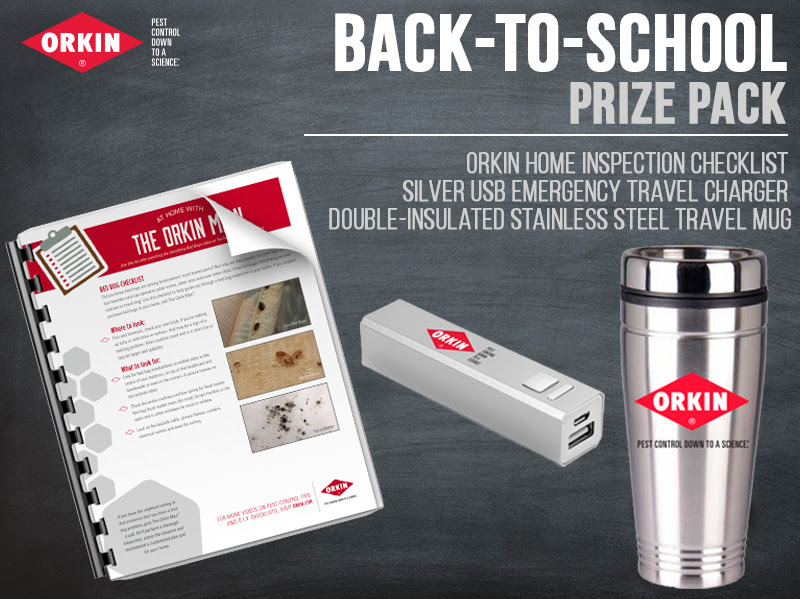 The Orkin Man is here to help you #LearnWithOrkin so you don’t get schooled by pest problems in your own home. 2. Take the Pest Prevention Pop Quiz and tell me which face you found most surprising or helpful. 3. What is your favourite tip from the *Protect your home* Checklist? Giveaway ends 9/12/15. USA Only. I will receive a prize pack identical to the prize given to the winner. I will receive no other compensation. All opinions remain my own. Last month I was on a family vacation in Minesotta and I was sitting on a dock with my family just chit chatting, I looked down and saw a HUGE beatle crawling up my arm! I jumped up and freaked out, almost falling into the lake. My family is still teasing me about it! This is embarrassing, but we live in a duplex and they put some really questionable neighbors next to us. One morning I woke up and there was a roach (from those dang neighbors unit) floating in my fish tank. I was so disgusted. We had to have the whole duplex treated. So miserable. I hate bugs! Luckily, they were gone on the first spray. I did get bed bugs in Billings Montana at hotel I had to stay at for work and it was awful! When we moved into our home now, I would walk down in the basement and see 5 or more spiders each time. Each time I killed them off and they just kept coming back. We have solved the problem now, thank goodness. I knew that spiders like to eat other insects, but I don't usually think about getting rid of other insects in order to get rid of spiders. That is interesting. My craziest pest experience would be the insect my cat brought to me in bed. I couldn't sleep at all that night worrying that she might bring me more.